* Cafe Rose starts off with pepper and hay surrounding a jammy rose. * The pepper burns off quite quickly (less than 5 minutes) and the rose really shines. * An hour into it, the rose starts to sing loudly with stronger projection then when initially sprayed. * A minty note starts to envelope the flower which kind of makes it sparkle. * This wears differently – sometimes, a light coffee note in addition to or instead of the mint note – which dries the rose out a bit. * In the base, the rose continues to be the focus with a clean patchouli and light amber grounding it. Summary: I should put in a disclaimer that I am a fanboy of the Tom Ford Private Blends (a Fordie), so I tend to really love the line. This is a bit difficult to write, but I am a bit disappointed with Cafe Rose. Of the four scents in the Jardin Noir collection, it was the only one that spoke to me on first sniff. When I wore it the first time, sprayed at the store – it was quite wonderful. With each additional wearing, the sparkle kind of dimmed. The idea of coffee and rose is quite fun. I was hoping it would be like a grown-up take of A*men with rose added (now that’s an idea for the next mashup collection for Thierry Mugler – someone call him), but it ends up being a good, if standard, rose scent with a little bit of patchouli and coffee in the mix. Cafe Rose isn’t bold or special enough to me- I like it, but don’t love it. Usually, the Private Blend lines inspire a much stronger reaction from me. 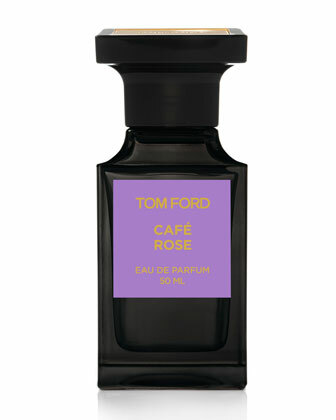 I am just imagining if they would have done Cafe Rose with the intensity of say Tobacco Vanille, or the quirkiness of Amber Absolute. The personality of the Private Blends that I love just isn’t here. Cafe Rose is a good rose, not a great rose. I will stick with Amouage Lyric Man and Le Labo Rose 31 for my go to rose moments. Tom Ford Private Blends are available from select Neiman Marcus and Saks Fifth Avenue. Disclaimer: Image courtesy of NeimanMarcus website. Sample provided by Saks sales associate. Thanks for your comment. Try it for yourself and let me know what you think. I had really high hopes for this one and on initial smell/wearing – it came close. Subsequent wearings disappointed me. Immensely. Its a good rose.. not a $200 good rose though. Good news.. I smelled Noir on a scent strip.. if it’s half as good on skin as it is on the scent strip.. it will be another case of the Tom Ford mainstream line outshining the Private Blends.